Surface protection of aluminium by electrostatic painting – powder coating in Nissal Newmet is done in a completely new, modern facility which guarantees fulfillment of the strict global standards. Aluminium products (profiles and accompanying elements) are being powder coated by using polyester powder paint, which is applied by electrostatic, in accordance with the QUALITCOAT certificate. Powder coating is possible for the aluminium profiles of all configurations, maximum length up to 7 m, as well as sheet metal, maximum dimensions up to 7m x 1,7m. Extremely large facility capacity (150 tonnes of aluminium profile per month) has been projected not only for the purpose of meeting the needs of its own production, but also for performing the service of powder coating for external clients. There are three different rooms for powder coating, which provides extremely high flexibility and the possibility for powder coating of even the minimum amount of aluminium profiles. The fact that service performing for external clients could be organized in a single day, with prior scheduling, is of a particular importance. Technological process of chemical preparation consists of the following phases: degreasing, deoxidizing, rinsing, passivizing, rinsing in demineralized water, hot-air drying. Chemical preparation is done by using the technology and the full technical support of the renowned German company “SurTec”, which has been a long-time partner of our company. Passivation in a layer 0,5 – 1,5 microns thick provides complete corrosion protection and excellent surface to be coated, in accordance with the recommendation of the QUALICOAT standard. Electrostatic powder application (in one of the three rooms) is done by using the most modern equipment produced by the Swiss company “ITW GEMA”. The powder is applied completely evenly, in a programmed manner for each profile, depending on the configuration. Polymerization of the powder is done in a sensor furnace, in which there is a constancy of temperature during all three phases of polymerization (heating the profiles, polymerization of the powder and cooling the profiles). Thickness of the polyester powder is 60 – 80 microns, which enables complete surface protection of the aluminium from further external impacts. The thickness of the layer, as well as the quality, are measured on each piece of final product in the company`s own laboratory, and all in accordance with the standards and requirements of QUALICOAT. The expert team of technologists provides full technical support for all demands and inquiries coming from the customers. Anodic oxidation of the aluminium profiles is performed in a brand new facility, with the capacity of 60000 A. 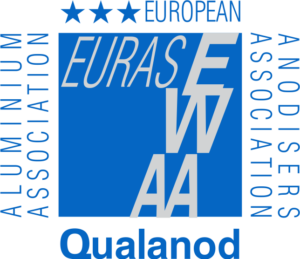 The process takes place in 25 different bathrooms and it guarantees the fulfillment of strict European standards “QUALANOD”. Anodizing and electro-chemical painting is done according to the very own colour chart as well as the colour chart of the European anodic oxidation “EURAS”, (which are compatible), ranging from the natural colour of the aluminium, through light bronze, medium bronze and dark bronze, to black. Anodizing is possible for aluminium profiles of all constructions maximum length up to 7,5m, as well as sheet metal, maximum dimensions up to 7,5 x 2,0m. The thickness of the oxide layer of the anodizing is 10, 15, 20 or 25 microns, depending on the customers` demands and the purpose of the profile. The capacity of the facility is 450 tons of aluminium profiles per month, and has been projected not only for the purpose of meeting the needs of its own production, but also for performing the service for external clients. Mechanical preparations which include sanding of the aluminium profiles. Sanding is done by using a very powerful stainless steel beads sanding machine, so that the result is an extremely even surface. Anodic oxidation – of the electro-chemical process used to “artificially create” aluminium oxide coating on the metal surfaces, which at the same time has protective, decorative and functional role. Anodic protection of the aluminium and its alloys is used to achieve the anti-corrosion protection, electrical insulation, increased wearing resistance, adhesive connection, which is important for possible later coating application, etc. The quality of the anodic layer depends on the quality of the aluminium, mechanical and chemical preparation, electrolyte concentration, temperature and the current density. It is important that the control of those parameters is not left only to the human factor, since there is a computer programming and monitoring. Permanent monitoring and managing the anodizing process, the balance of current density, solution concentration, temperature, as well as the thickness of anodic layer is achieved by means of the software. Once the predetermined thickness of the layer is reached, the rectifier is switched off, and the achieved results remain stored in the computer, which enables issuing of the written reports on achieved quality of anodizing of certain batches. The overall capacity of pulse rectifiers is 60000 A, which enables anodizing of approximately 450 t of aluminium profiles per month. Electro-chemical painting – a phase in which all colours of anodizing are obtained, except for the natural aluminium colour, by depositing metal ions in the pores of the anodic layer. Final silage – high-quality permanent closing of aluminium oxide pores. Final profile packing – wrapping several profiles with paper of PVC plastic tape, depending on their configuration. Final products of anodic oxidation are examined daily in laboratory according to QUALANOD standards under the management of the team of technologists with long-time experience, which guarantees the quality of delivered products.